A little Air Force plane pr0n for you. I don’t have any backstory on this. The USS Midway (CV-41) arrived in town late last night – I thought she was going to Broadway Pier, but instead she was at Pier M/N, where my old boat used to moor, back before they decommissioned the old girl (snuffle). Midway has been decommissioned for the better part of 10 years, and has recently been prepared to be a museum piece for downtown San Diego. The thing that struck me was how very small she was, compared to USS Last Ship, which in turn was small in comparison to the Nimitz class ships that make up the bulk of the carrier force these days. Midway was a forward-deployed carrier for many years, homeported in Yokusuka, Japan. I never flew off of her (but did fly off one of her sister ships, Coral Sea). She was unique in a couple of different ways: for one thing she only had bow catapults, with no cats on the waist. Strangely, she only had three arresting gear cables, or wires. Turns out the deck was too short for another wire aft, and too short forward to put an arresting gear that would stop a jet before it went over the end without breaking something off. This deck layout makes operating the carrier in Cyclic Operations (the normal mode) rather difficult. With no waist catapults (the ones in the landing area, angled outboard) the flight deck crew had to do a full re-spot of all the aircraft from the preceding recovery prior to the next launch. On a Nimitz-class (with a much bigger flight deck), this could take 2 hours. Midway’s crew could somehow do it in less than 45 minutes. This flexibility coined the expression “Midway Magic,” and it became a part of her legend as a fighting ship. For the Midway crew, the difficult was easy, and the impossible merely took a little longer. When I was stationed in Japan, the Midway had recently been relieved by the USS Independence, a Forrestal-class carrier. Her sisters (aside from Forrestal) were Saratoga and Ranger. They were awkward brutes, transitions between the World War II modified ships to the Nimitz class ships. Indy was not an easy ship to love, and she suffered in comparison to the magical Midway. By the time I joined the ship, the Midway had become “the M-word,” and we weren’t allowed to utter it anymore. Being a small carrier (45,000 tons, as opposed to 80k on my ship, and around 100k on the Nimitz class), she tended to bob around in heavy seas a bit more than was thought proper for a lady. The shipwrights in Japan thought they could attach some stabilization blisters to her hull, so that she would ride a bit better, in order to help the pilots get aboard in poor weather. Someone didn’t do all their fluid dynamics homework very well, since in certain sea conditions, the blisters turned what had been a mildly objectionable pitch, roll and heave into something that belonged in a circus sideshow, or drunk tank. One of the things I liked about the older carriers were the names they carried – they evoked famous battles fought and won, or were the names of brave ships from an earlier era recycled to the new age. We had the ESSEX, YORKTOWN, INTREPID, HORNET, TICONDEROGA, LEXINGTON, BUNKER HILL, WASP, BOXER, BON HOMME RICHARD, ANTIETAM, PRINCETON, KEARSARGE, ORISKANY, SHANGRI-LA (? ), TARAWA, VALLEY FORGE, and PHILLIPINE SEA. We had KITTY HAWK, CONSTELLATION and AMERICA. We had an ENTERPRISE.Then we named a ship JOHN F KENNEDY in memorial of Camelot lost, and the gates were opened to all manner of political monikers. After NIMITZ, we had EISENHOWER, VINSON, ROOSEVELT, LINCOLN, WASHINGTON, STENNIS, TRUMAN, REAGAN and finally BUSH (the elder).Politicians.I guess once the floodgates are open, everyone wants a drink. And for $5billion or so, who are the uniform guys to complain? Call it “FUSCHIA” or “PUMICE” so long as we get her on schedule and she floats.Please don’t get me wrong, I admire all (or most) of these men. Still, I sometimes envy the Royal Navy, with their INVINCIBLEs and BROADSWORDs and DEVASTATIONs. Those are names to wear on your sleeve or cap with pride. Someday perhaps, we’ll even have a ship named the USS BILL CLINTON. Won’t be a frigate though. A frigate only has one screw. 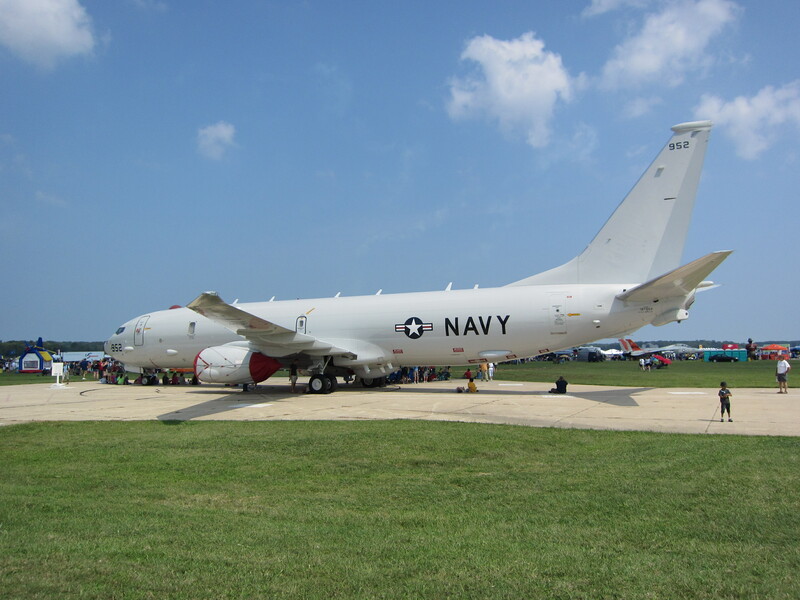 Not the sexiest machine, but half the future of maritime patrol. They’re flying the P-8 test force at VX-20 hard. Test programs have a way of being put in a crisis mode – the program is behind schedule, over cost, and the test team gets told to start working 6 days a week/10-12 hours per day to make up the shortfall. Ugly. So Cubi Point it was, in the Philippines that was, on one or another cruise from here to there and back again in the service of the Greater Good and racking up shipboard arrested landings, just for the bragging rights that were in it. ‘Twas a “working inport,” which meant of course that the blackshoes professional surface warfare officers had to busy themselves about the rust stains adhering to the hull of our warship, herself half-way returned from the uttermost parts of the world, with the signs of the sea showing plain. Well, that and ordnance offloads and re-tiling of the mess decks, a task that seemed an almost monastic devotion aboard certain ships, the one aboard which I had the honor to serve being not least among them. As for us, we few, we happy few, we band of pilots, our “work” consisted mostly of sleeping on both ears until maybe 1000 or so, making a high speed pass through the ready room in wash khakis for 10 minutes or so to check for mail and then standing around Looking Professionally Concerned About Stuff before remarking, as though to no one in particular, that we’d be heading off the ship at 1100 for to get some chow if anyone cared to join us. The Naval Station Subic Bay/Naval Air Station Cubi Point was a charming remnant of the old empire, a little bit of home carved out of the e’er encroaching jungle and to put it plainly, something of a social wasteland once the carrier pulled in. You see, all the cleverer Navy nurses withdrew themselves into the shadows even as the superannuated captains locked their teenaged daughters in the basement once we came ashore in all our epic grandeur, escorted as we were by 5000 or so of our closest friends, looking for whatever adventure might come. We pretty much had the run of the place as the permanent party peeked out at us from behind their Venetian blinds, while the local labor force bore up under the weight of our injunctions, each of them wondering when it would be that we’d pull out again, surely soon for the love of God? Chow ashore for the noonday meal very often consisted of Cubi Dogs and ice cubes, both served at the Cubi Point O’Club, the former being nobbut a hot dog served Philippino style, in no way dissimilar to its American counterpart, while the latter were found at the bottom of a Cubi Special glass. In order to balance our diets by getting at the ice cubes – and do so without making a mess of one’s shirt – it was necessary to drain the Cubi Special of its liquid contents, however. Those contents consisted of a particularly potent combination of Bacardi 151 rum combined with divers fruit juices, the latter considered salubrious in that equatorial clime, while the former served as a kind of preservative. Thus fortified by our endeavors, afternoons often consisted of stertorously snoring by the poolside, baking our jailhouse pallors in the tropical sun. These our well-earned rests were often interrupted by the Tomcat guys, who, when they weren’t weepily engaged in telling one another how much they loved each other (and, by proxy, themselves) were locked in grim and as it were, nearly mortal, combat over the Ancient and Honorable game of Animal Ball – a wetter version of the sport known and loved by NBA fans across the world crossed with rugby. If in fact it’s possible to drown at rugby. Awakened, refreshed and more nearly approximating our perfect selves, we’d stop by the exchange to look at all the things we couldn’t afford but decided to buy anyway, prices being less than back at home and look at all the money we’d saved! After which the real business of the night would commence, the part that put the word “work” into the term “working inport” for the aviators, as we’d sortie out in force into the badlands beyond the gate, crossing Sh!t River and heading out into Alongapo or even The Barrio itself, saints preserve us and I hope you brought protection if you plan on drinking that mojo because I’m washing my hands of you, the way that you get. Oh, we’d go out in martial force gentle reader and it would have made your heart glad to see us arrayed in our splendour as we passed the ramparts with our pennants proudly fluttering in the breeze and our chins held high. But it was a damned hard service there on the empire’s outer rim, our foe was experienced and crafty and not all of us who went out beyond the wire would make it back again, selah. So yes, we took our losses out in town, and if I might be permitted to tell the truth at this late juncture, even of those who made it back in safety – often severely wounded by the experience and some even crawling across the threshold supported by their friends – there were few who were not much reduced by the experience, not to say shattered. I wear the scars to this day. An alternative to that experience, not to be pooh-poohed in a long inport after several consecutive nights of Alongo-slaughter, was to take a safety day and remain within the comforting encasement of the Cubi O’Club itself. There, having taken your afternoon ease by the pool, you could start your evening playing shuffleboard at the upstairs bar, looking at all the cruise plaques bearing the names of Those Who Went Before Us in between turns – the place has been faithfully replicated by the way (apart from the beer stains on the carpet) at the naval aviation museum in Pensacola, Florida. You might also stroll by the dining room, where the local residents would sneak out when they thought the coast was clear to eat actual food while being serenaded by one or another of the exceptionally talented cover bands, most of whom were legally obligated at some point to sing, “Peelings, nothing more than peelings, trying to porget my, peelings of love!” an experience that somehow left the listener both mildly amused and maudlinly homesick. Finally there was the downstairs bar, where the air wing would rock the house so late as to become early again, far away from the Disapproving Eye of the grown-ups upstairs, and whose L-shaped bar had, at its apex, the actual cockpit of a DC-3, facing out into Subic Bay. This was obviously a temptation of the most irresistible sort for any true aviator, and the attraction was not reduced but rather augmented gentle reader by the fact that between the two cockpit seats was a logbook, itself bearing the marks of many a famous aviator who over the years who had dared to jump the bar for to sign himself in. This simple act assured him an eternal place in the pantheon of naval aviation godhood, not least because going behind the bar while it was open – and only a scrub would sneak back while it was not – was a thing done under the threat of Significant Financial Consequence. You see, there are any number of ways to end up buying a round of drinks for all your friends in the naval service: Ringing the bell for example without cause, wearing of headgear within the confines of the bar or bearing arms while not actually on watch, rolling five aces or losing a die over the side during a game of chance and of a surety, going behind the bar. These are all offenses grievously sufficient to the punishment of buying drinks for your friends. I do not, for now, mention the Dead Bug. Surrounded by over a hundred rowdy aviators in various stages of moral decay, getting caught behind the bar could cost you a very great deal of money indeed because even in the PI buying a hundred bottles of beer wasn’t as who should say “cheap,” not to mention the certainty that at least some of those who were first served by your forced generosity would make their way to the end of the line for a second helping before the bill could be paid, the thieving bastards. So it came to pass one night, far after the usual GICOT* had passed that your correspondent and a colleague of his close acquaintance whom we shall call “Lenny” (since that was, in fact, his name) settled on a seemingly infallible plan: We would, with a number of our other brothers of different mothers, contrive to simulate a brawl sufficient to draw the attention of the assembled throng away from our persons. With lumpen masses thus entranced by the on-going rumpus, we would steal behind the bar, make our way into the cockpit and sign ourselves into eternity. The idea was flawless, perfect, complete to the last detail. What could possibly go wrong? Well, I’ll tell you gentle reader, and this one is for free: You can never truly go wrong by over-estimating the depravity of the human spirit, the venality of naval aviators when it comes to the article of booze, or the envy of your fellow man. We were no sooner behind the bar and past the point of no return than some our erstwhile comrades flipped sides, breaking their troth with us and halting the rumble – which had started to grow admirably, by the way – just long enough to dime us out in front of the whole multitude there assembled. You could have heard a pin drop, or at least you could until Sammy the bartender started avidly a-ringing on his bell, signaling to all and sundry (no few of whom had been up until this moment at the upstairs bar and whom, like New Jersey whiplash claimants jumping on a city bus after an in-town fender bender, scurried down the stairs at this Pavlovian signal of fiscal blood in the water) that the next round was on Lex and Lenny. Ah, well – it was a small enough price to pay for immortality. I wonder whatever became of that logbook. As a squadron commanding officer, I had to discharge two otherwise fine Sailors who had “popped positive” on urinalysis screens for having THC in their systems. They were good kids, from bad backgrounds – the service had been a lifeline for them, a chance to remove themselves from bad situations. And I had cut that lifeline – sent one back to the gang infested streets of El Paso. The other returned to East Los Angeles. Truly, my hands were tied. The Navy has a zero tolerance for drug abuse – it is the surest ticket out of the service, with an “other than honorable” discharge. An OTH won’t debar you from federal employment like a bad conduct discharge, nor is it equivalent to a felony conviction, like a court martial sentence would be. But neither will it move you, by itself, to the “must hire” queue in any prospective employer’s candidate search. When I was a third class midshipman, I cruised aboard a Spruance class destroyer, and drug abuse was fairly rampant – this was back in the late 70′s, and then, as now, many of our Sailors were products of their time. At night an officer could head aft to the helo deck, and watch two or three lounge-abouts flick the burning remnants of a marijuana cigarette over the fantail, and do nothing about it – nothing at all. Morale in the 80 man supply berthing, where we youngster mids made our racks, was terrible – everyone seemed to hate the Navy, at least among the junior folks – everyone was counting the days until they could get out. It was a real eye-opener. In 1981, an Marine reserve crew in an EA-6B had a landing mishap (a ramp strike) aboard the USS Nimitz. In the mishap itself, and the resulting conflagration, 19 Sailors died. Eleven were found to have THC in their blood during the post-mortem. Everything in the Navy depends on teamwork, much of it done around heavy equipment that moves inexorably at great speed – some pieces of gear and environments I have seen could not have been better designed had it been done on purpose to claw and rake at unwary flesh, governed by a diminished mental capacity. CNO sent out his famous “Not in My Navy,” missive, and routine drug screening began for the first time. CO’s were given temporary authority under “Project Upgrade” to discharge malcontents, malingers and ne’er-do-wells immediately. Anyone who swore they hated the Navy and wanted out as soon as possible was offered the instant opportunity – some took it gratefully (although these were in fact few), some were given it without asking. The next time I deployed, this time aboard an LST, the USS Barbour County , the difference in morale was incredible. Everyone knew that we had an unshakeable standard, that there was no flexibility, no second chances and for those inclined to gripe about their lot in life, an easy way out – to the ones who wanted to be a part of something special, an organization that stood for something, this was part of the proof that they were. I remember distinctly the time when a signalman had been found in the act of smoking marijuana – there was a Captain’s Mast, a non-judicial procedure in which the CO is invested as prosecutor, defense attorney and judge, simultaneously. The accused was brought before the CO, and forced to stand at attention. We mids had been asked to watch the process, it being thought good for our professional education. An LST, designed to work in close proximity to the shore (and in fact to run up upon it) is a flat-bottomed boat, and in the relatively high seas between San Diego and San Francisco, our next port stop, she rolled around at an alarming rate and angle. The poor Sailor, standing at attention, was challenged to maintain his balance. Some of the junior mids found his efforts to maintain his footing unbearably humorous, and could not stifle a snigger. The CO wheeled around on them, and tongue-lashed them with great violence in front of the entire assembly until they dropped their eyes to their reddening cheeks in shame. We got the message – this was a man’s life, about to take a turn very much for the worse. It was nothing to laugh about. After talking with the CO, I no longer thought it unfair. I thought it hard. And I began to realize – it can be a hard service. When my turn came to wear the command pin, I had very much hoped not to have any of my Sailors fail the drug test, or otherwise fail to demonstrate a pattern of acceptable performance – These were other peoples sons and daughters, given to me in trust. They had dreams and goals and aspirations that they thought the Navy could help them reach. No one joins to be a failure. I tried to love each of them as though they were my own family, I wanted them all to succeed. Their dreams I tried to make my own. Oh, I knew that I could never save all of them – some come to us with a lifetime of emotional baggage that cannot be overcome in the short time a Sailor has to prove that he can perform, or not. We are not a charity, not a half-way house. But I also considered anyone who had to leave the service other than on his own terms as much a failure of my leadership, my ability to reach him and make a citizen of him, as much as his own failure to measure up. So when one particular Sailor, in whom I had invested a deal of personal time and effort, and who came from a very difficult background, and had been showing great promise, popped positive on the urinalysis test, I was not angry – I was sad. He hadn’t gone out with the idea of getting high – he’d had a few too many drinks, fell into a bad company, was offered drugs and used them. On Monday morning, his number came up for a random sweep. In a week’s time, he stood before me. I’ve done a number of Captain’s Masts – and I never really enjoyed them. The mask of austere gravity and dreadful authority that the role required me to wear ill-comported with my ever-present awareness of my own manifest shortcomings, especially those of my youth. Some CO’s that I have seen were “flamers,” those who seemed to enjoy the humiliation of their accused. They’d scream and rant and gesture. I was never one of those. For this young man, I had nothing but regret – he and I both knew what he had done, and the penalty it carried. He and I both knew what he would be returning to, having left the Navy as a failure. The Navy, a place where the path and means to success is as brightly illumined as any I can imagine – having failed at this, what could he expect? But my hands were tied, and he knew it – it was for the good of the service. For those of you not on Facebook I hereby share what I saw last night, in the parking lot of the grocery store. The fact that this is the liberal wasteland of New England – it was surprise enough. That is was on a Subaru in a Whole Foods parking lot was – shocking. The Oracle and I both just – stopped dead and stared. I wanted to take an actual picture (the image above is a grab from Google Images) but the owner was sitting in the car. Herself in her late 20s, possibly early 30s. In New England. In a Subaru. At Whole Foods. And for each thing a season. And right now, I think it’s time for a rant. I received a resignation letter from a junior officer recently. Not the one I blogged about here , a different one. A resignation letter is a two-part document: the first page or so is a statement of particulars; name, SSN, service entry date and resignation eligibility date. You have the opportunity to state whether or not you’d like a commission in the reserves. Page 2 is an attachment, a chance to express your reasons for leaving the service. Most folks who leave the service will talk about family separation, or opportunities “outside” that can’t be passed up. Most will express gratitude for the opportunity to serve, tinged with regret on the decision to leave. It’s mostly apple pie stuff. And it isn’t really read by anyone more senior than a LCDR detailer at the bureau of naval personnel. It’s not going to change the course of this old boat even one half of one degree. The only folks who will read it are in the officer’s chain of command, and that one detailer. Who will read it, mutter “hmph” and forward it to the separations branch, marked “endorsed.” Some time later a message will come to the command, thanking the officer for his faithful service, and wishing him the best of luck. We’ll hold a farewell, wish him well, and move on. Every once in a great while, you see a letter that carries as an attachment a screed. This particular letter was of that nature. And maybe I’ve become a company man without quite noticing, but it made me mad enough to spit nails. This young gent got his four year degree at USNA, on the taxpayer’s dime. He went to flight school, and has paid off his obligated service that comes with both those accomplishments – he has every right to try life out in the wide, wide world. But his “reasons for leaving” letter pointed out that he did well in flight school, but still didn’t get the airframe he really wanted. He did well in his fleet training squadron, but got sent to a fleet squadron forward deployed in Japan, a place he didn’t really want to go. While there, he worked for officers he considered to be of inferior quality, and wouldn’t want to work for them ever again. He did a great job in the squadron, finished competitively, and so was offered the chance to come to our staff, in San Diego. He could have gone just about anywhere, but he chose us – it’s considered a plum job. This is all just so much wanking. Orders are orders. Misery is optional. There are no guarantees. If you don’t get the aircraft platform you really wanted, you can either bloom where you’re planted, or shrivel up and die. And it’s not anyone’s fault, and it’s not personal – it’s just business. The needs of the service are paramount. The service. Remember that word. As far as the tour overseas, in Japan – well, that’s where we send our best junior officers. The training establishment can’t support the forward deployed folks quite so well, so you send the self-starters. And it’s a great operational tour, which he admitted loving, and obviously excelled at. As far as not admiring your next tier leadership, from my point of view you can either curse the darkness or light a candle. Some of the best teachers I ever had were the worst leaders. I learned what not to do, by example. Or, you can take your ball and go home, I guess. As far as orders to our staff, leading afterwards to a ship tour, a carrier tour, it’s important to understand that there is a karmic balance to orders in the Navy. If you get a good deal, you are expected to do a payback tour, a hard tour. Having completed the hard tour successfully, you are now entitled to a plum. And so on. So when this young man tried to get orders back to a squadron for a second JO tour, his request could not be accommodated. He didn’t fit. He was having his good deal now, and somewhere else, someone was earning the job he wanted. Now, when he was leaving his first tour, he could have chosen a job as a weapons and tactics instructor – a hard job, but a prestigious one, definitely career enhancing. The plus up for doing that job successfully is that you go back to the fleet for your “super-JO” tour. That is the quid pro quo. As a senior guy, wearing a WTI patch, you’ll break out competitively, move seamlessly into your department head job in the cockpit, and have a superior chance to screen for command down the road. Command at sea is the coin of the realm. Lots of fast-trackers go that way, some choose other paths. But the choice is theirs, and opting out to live in San Diego in a nice staff means that you’re going to pay Peter eventually aboard a big gray boat. Two years, then back to the fleet in your aircraft. It’s considered a small price to pay by the company, but it overwhelms some folks. And really, there’s no place in the fleet that needs super officers more than our aircraft carriers. A Catapult and Arresting Gear Officer job (a “shooter” tour) is not looked upon with glee by anyone. Long, dangerous hours on the flight deck in all conditions, always on call. But having done that hard job, the company will smile upon you. And here’s the thing – as a division officer aboard a carrier, especially on the flight deck, you’ll have 80 to 100 18-20 year olds for whom you may be the one person in the world who really gives a sh!t about them that can actually do something to make their lives better. Whether they get to eat one hot meal a day, get 4 hours of sleep, get their laundry back or have curtains for the racks, to provide them the merest shred of privacy will be entirely on your back. These are real people, with real dreams doing an incredibly demanding, reducing job, and we desperately need caring officers to, well, care. But my man can’t be bothered. It’s below his dignity. He’s getting screwed. At some point as an officer, you’re supposed to realize it really isn’t all about you. You’re supposed to realize that you’re in the service, and that with service comes sacrifices. Aviators can be forgiven for forgetting this at times. All through the training track, it really is all about them. All of the instructor pilots, all the infrastructure, all the investment is designed to make them weapons of war. When you get to the fleet however, you are typically assigned a division officer job, with 30 – 60 Sailors who depend upon your leadership. A chief petty officer, a senior enlisted with 14-18 years of experience, is assigned to “assist” you, really to train you. If you finish your first operational tour and still think it’s all about you, you weren’t paying attention. It is a team, you are a part of it. And it’s worthwhile remembering that this company honor sacrifice, honors service, honors teamwork. It honors honor. For each negative spin of the karma wheel, comes a positive spin. We’ve got hard work to do, we need good people to do it, and they will be rewarded. But if you can’t dedicate two years in 20 year flying career to serving out of the cockpit without wanking about how you’re getting screwed, then I really don’t care to share my Navy with you.